The Bremerton YMCA Swim Team will be hosting the 3rd edition of the Snowman Invitational on Jan. 16 at 1:30 p.m. The meet includes YMCA teams from throughout the Greater Puget Sound Area, ages 5-18, at the Glenn Jarstad Aquatic Center. The Bremerton team hosts about 6-8 meets a year, but this meet has been the most popular and typically draws about 400-500 people, said Greg Mackem, assistant aquatics director for the Bremerton Family YMCA. “The Snowman Invitational has been especially popular because it fields good competition, maintains meet records and often draws many former alumni of the Bremerton YMCA Swim Team. Sad news for everyone in the swimming community … This story from the Associated Press’s Jennifer Kay adds more to the story of a Dartmouth College swimmer who died while trying to complete four laps underwater. MIAMI (AP) — A Dartmouth College swimmer who died at a YMCA pool had been trying to complete four laps underwater without surfacing to breathe when he went into distress, according to a sheriff’s office report released Monday. Tate Ramsden, 21, of Nashville, Tennessee, was pronounced dead at the Sarasota pool after lifeguards and emergency medical personnel could not revive him, according to the Sarasota County Sheriff’s Office incident report. Ramsden was at the pool Saturday with his sister, uncle and a cousin. At some point, Ramsden’s sister and cousin noticed that he was not moving underwater, and they alerted lifeguards who removed him from the pool, Stidham wrote. Water and blood came from Ramsden’s nose and mouth throughout the attempts to revive him, according to the report. Ramsden swam for Dartmouth as a freshman and sophomore. He was scheduled to graduate from the school in Hanover, New Hampshire, in 2017. In an email Sunday evening to students and faculty, Dartmouth President Phil Hanlon wrote that Ramsden’s family has planned a memorial service next weekend in Nashville. “We have been in touch with Tate’s family to share our deepest sympathies with them at this time of heartbreaking loss,” Hanlon wrote. A message left for Ramsden’s sister was not immediately returned, and a person who answered the phone number listed for Ramsden’s mother hung up on an Associated Press reporter. Associated Press writer Travis Loller in Nashville, Tennessee, contributed to this report. The TV rebroadcast of the Duel in the Pool will be aired Saturday on NBC at 4 p.m. This isn’t a spoiler for anyone who is a swimming fan since I wrote about it extensively late last week. 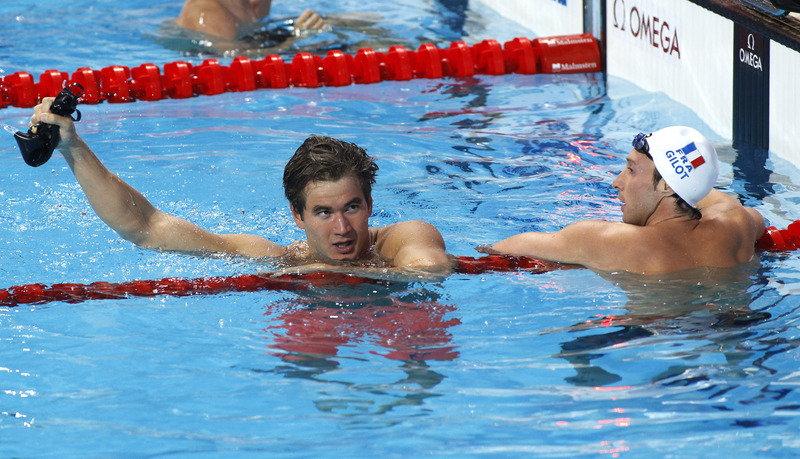 Nathan Adrian won both the 50 and 100 freestyle races as Team USA beat the European All-Stars 155-107. But, in case you weren’t able to watch the lifestream, you can watch the tape delayed version this Saturday. seventh Duel in the Pool on Saturday at Indianapolis, Indiana, 155 to 107. “But really, it was an incredible job done by pretty much everyone around,” Adrian said of the U.S. effort. “We won a lot of close races and if those wouldn’t have gone our way, this meet would be completely different and it could be the other way around. Adrian won the 50-meter freestyle in the short-course meter event that billed some of the top American swimmers versus some of the best swimmers from Europe. Adrian touched the wall in the 50 in 20.95 seconds. His win gave the U.S. a 139-91 lead and clinched the team title. “I certainly knew that I didn’t want to be part of the first team that ever lost this so, you know, glad to not do that,” Adrian said. Adrian then teamed with Matt Grevers, Josh Schneider, Michael Chadwick, to win the 4×100 freestyle relay in 3:05.42. On Friday, Adrian won the 100 free in 46.57 seconds. Adrian jumped out to a quick lead and was under world-record pace at the 50 split in 21.68. Josh Schneider finished second in 46.66 and Vladimir Morozov of Russia was third in 46.68. Adrian also anchored the men’s 4×100 medley relay team, which included Matt Grevers, Kevin Cordes and Tom Shields, to an American record in 3:20.91. 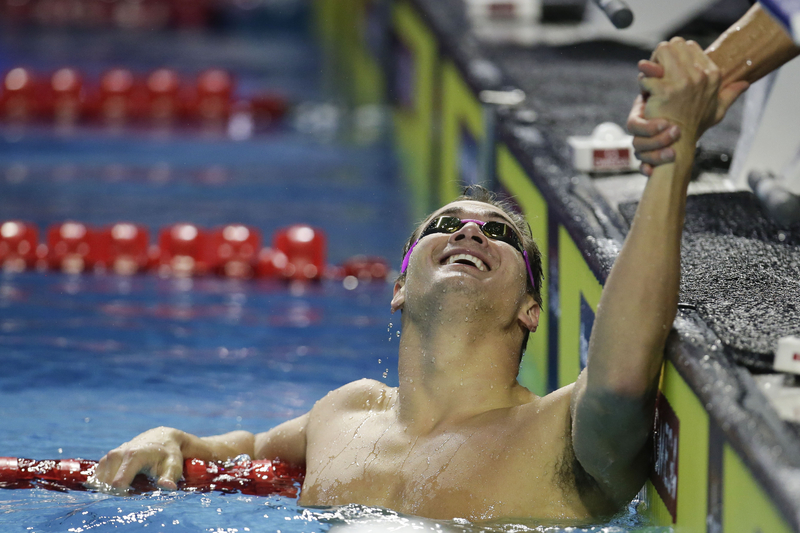 Bremerton’s Nathan Adrian, left, celebrates beside France’s Fabien Gilot after the US team won the gold medal in the men’s 4x100m medley relay final at the World Swimming Championships in Kazan, Russia, Sunday. 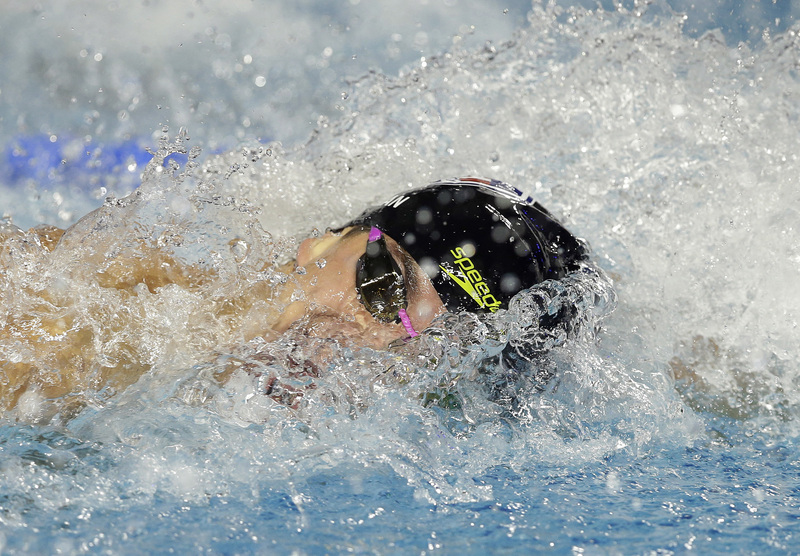 Nathan Adrian of Bremerton will swim Friday and Saturday at the Duel in the Pool, Friday and Saturday in Indianapolis. The 100-meter freestyle is Friday and the 50 freestyle is Saturday. The U.S. roster also includes Missy Franklin, Simone Manuel, Jessica Hardy, Tyler Clary, Conor Dwyer, Matt Grevers and Ryan Lochte. The meet is being livestreamed at usaswimming.org.